Republic Services Inc. is a waste and environmental services provider based in the United States. Since its inception in 1981, the company now ranks as one of the top companies in the 2016 DJSI World Index in corporate leadership governance, environmental, social, and financial outlookWhat is Financial ModelingFinancial modeling is performed in Excel to forecast a company's financial performance. Overview of what is financial modeling, how & why to build a model. A 3 statement model links income statement, balance sheet, and cash flow statement. More advanced types of financial models are built for valuation, plannnig, and. Republic Services’ areas of operations include collection, transfer, disposal, and recycling of non-hazardous waste. In June 2008, Republic Services became the second largest waste management company in the United States after it acquired its larger competitor, Allied Waste Industries. The acquisition was worth $6.1 billion in Republic Waste stockStockWhat is a stock? An individual who owns stock in a company is called a shareholder and is eligible to claim part of the company’s residual assets and earnings (should the company ever be dissolved). The terms "stock", "shares", and "equity" are used interchangeably., and the merged company was estimated to post a projected annual revenueSales RevenueSales revenue is the starting point of the income statement. Sales or revenue is the money earned from the company providing its goods or services, income of approximately $9 billion, with total market capitalization of $8 billion. Republic Waste employs more than 33,000 individuals and serves over 13 million customers in 41 states and Puerto Rico. 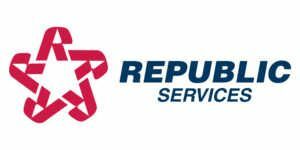 Recently, Republic Services started replacing their diesel-powered trucks with compressed natural gas trucks as a way of reducing carbon emissions. As at 2016, the company operated a fleet of 2,500 trucks powered by the compressed natural gas, which saves at least 21 million gallons of diesel. The trucks are supported by more than 38 gas fueling stations spread across their areas of operations. For example, a compressed natural gas fueling station opened in Long Beach, California in 2016, serves over 56 garbage trucks that replaced the company’s diesel trucks. Approximately 16% of the company’s fleet of vehicles are powered by compressed natural gas, with plans to phase out diesel trucks altogether in the future. The company also uses solar energy to recycle solid wastes. In 2015, Republic Services launched a 110,000-square foot recycling plant in Las Vegas powered by solar energy. The rooftop solar panels generate enough power to run the recycling plant for up to three months, with the plant producing one million pounds of recycled paper every day. Once the plant automation is completed, it is projected to recycle three million pounds of paper every day. The company also initiated another solar energy project in Massachusetts in September 2017. The 13.5-megawatt solar energy project will comprise approximately 41,000 solar panels to power 1,900 households. The project is built on three former landfills, and it will reduce carbon emissions by more than 14,000 tons. Republic Services owns the largest landfill in the United States, which measures 2,200 acres and is located in Nevada. In total, the company owns 193 active landfills and is responsible for 126 closed landfills. The Bridgeton landfill near St. Louis, Missouri, is the site of an underground event that is of concern to area residents and the Environmental protection Agency (EPA). Republic Services installed equipment at the landfill in 2013 to reduce gas flare and treat contaminated liquids. Since then, the level of contamination of gas and liquids has fallen below EPA acceptable levels. The company operates 69 landfill gas and renewable energy projects across the United States. The projects involve converting gas, a byproduct of decomposing solid waste, into electricity that is then supplied to homes. In the Metropolitan Atlanta area, Republic Services uses three gas-to-energy facilities to produce 24.1 megawatts of electricity that is enough to supply more than 15,600 households. The company also started another gas to energy project in 2015 at the Sunshine Canyon Landfill near Los Angeles. The 20-megawatt project can supply enough electricity for nearly 25,000 households in surrounding areas. Out of the 193 active landfills owned by the company, 52 are energy generating plants that produce 323 megawatts, which is sufficient to power almost 250,000 households. Republic Services invests 45% of its revenues into developing new technologies and empowering the community. Although the firm mainly focuses on waste management, it partners with other organizations in the United States to initiate new programs that positively impact communities. The company’s Blue Planet Sustainability initiative documents its efforts on improving safety standards, reducing carbon emissions, increasing community engagements, and employee growth opportunities. The company is also involved in an oyster shell collection program. The program is a partnership between Republic Services and Alabama Coastal Foundation and targets 28 restaurants. The program aims to sensitize the public about the importance of recycling oyster shells and creating a sustainable habitat for oysters. In 2016, Republic Services, in partnership with Lab USA, launched the state-of-the-art ash metal recovery center at the Roosevelt Regional Landfill in Roosevelt. The facility extracts metals from the ash dumped at the landfill. It allows for the reclamation and recycling of metals that would otherwise be lost in the landfills. The metal recovery center is projected to collect and recycle 46,200 tons of ferrous metals and 42,900 tons of non-ferrous metals. Recycling metals saves energy that would’ve been used in mining, and this reduces greenhouse gas emissions in the future. In Oregon, Republic Services, through its subsidiary Allied Waste, upgraded the Pacific Region Compost Facility to accept fast foods such as bread, meat, and vegetable products. According to the Oregon Department of Environment, the state’s fast food’s waste comprises 15% of all the wastes deposited in the landfills. Allied Wastes used the Aerated Static Pile Technology in composting systems to capture and control emissions from the composting process. The technology employs a negative air system to reduce the amount of stormwater runoff.